The origins of Castile Soap can be traced back to The Levant where Aleppo soap makers have been making olive and laurel oil based hard soaps for millennia. It is commonly believed that the Crusaders brought Aleppo soap back to Europe with them in the 11th century. Following the Crusades, production of this soap was extended to the whole Mediterranean area. 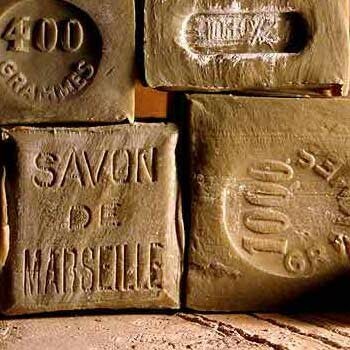 The first European soap-making factories were created by the Muslims in the 12th century in Spain (Alicante, Malaga, Carthagene and Castile) and in Italy (Naples, Savone, Genoa, Bologna and Venice) and then, in the middle of the 15th century, in Marseille France, giving birth to Marseille soap. However, early soap makers in Europe did not have easy access to laurel oil and therefore dropped it from their formulations thereby creating an olive oil soap now known as Castile soap. Importations of “Castile soap” through Antwerp appear in the London port books of 1567–68 (Dietz 1972), though the Oxford English Dictionary has no references to “Castile soap” earlier than 1616. In his article “A short history of soap”, John Hunt maintains that barilla (an impure form of sodium carbonate obtained from halophyte plant ashes that were high in sodium) was boiled with locally available olive oil, instead of tallow. By adding brine to the boiled liquor, the soap was made to float to the surface, where it could be skimmed off by the soap-boiler, leaving the excess lye and impurities to settle out. This produced what was probably the first white (Aleppo soap tends to be green) hard soap, which hardened further as it aged, without losing its whiteness, forming jabón de Castilla. Apothecaries knew the product by the Latin names of sapo hispaniensis (Spanish soap) or of sapo castilliensis (Castilian soap). Bars made using just olive oil should be left in the mold for at least 48 hours. They will need at least 4 to 6 weeks to cure. You can add fragrance to this soap if you wish. Using an online fragrance calculator, select your fragrance and calculate for cold process soap at 20 ounces to determine how much to use. 1. Measure the olive oil into your plastic container. Place the container in a larger pot and pour in enough hot tap water that the container begins to float. Set the pot on the stove and turn the heat to warm. Insert a thermometer into the oil. 4. Monitor the temperatures of the two containers. Basically, you are heating up the oil while the lye cools down. You want both to reach 110°F. As needed, refresh the hot water bath or turn the stove burner higher to raise the temperature, or use a cold water or ice bath to bring the temperature down. 5. When both the oil and the lye mixture are at 110°F, pour the lye mixture into the plastic container with the oil. Blend until the mixture reaches medium trace (it will be like thick gravy, and drizzled trails will stay on the top). 6. Pour into your chilled mold (or a clean, dry, quart size milk carton with the top cut off) and refrigerate, uncovered, for 30 minutes. Remove from the refrigerator; spray the top with isopropyl alcohol, cover loosely with plastic wrap, and refrigerate overnight. 8. Unmold 48 hours after pouring into the mold. Cut into bars and place in your curing area.